Police are issuing CCTV images of two people who may have information to assist our enquiries into a theft from a shop in Aintree. At around 1pm on Saturday, 12 January two offenders entered the Mothercare shop in Aintree Retail Park and took a blue Silver Cross pram worth a significant amount of money. The matter is being investigated and we would appeal to anyone with information to come forward and help us identify those responsible. 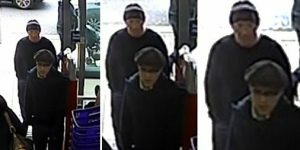 Constable Helen Davies said: “We are keen to speak to the two males pictured who we believe may have information to assist. If you know who they are, please do get in touch. Anyone who recognises these men is asked to contact the social media desk @MerPolCC, call 101 with reference 19100012302 or you can call or the independent charity @CrimestoppersUK anonymously, on 0800 555 111. You can also use their online form at: https://crimestoppers-uk.org/give-information/give-information.